Cat Carlisle's Writing Blog: I'm Doing Camp NaNoWriMo! At least, I think I am. 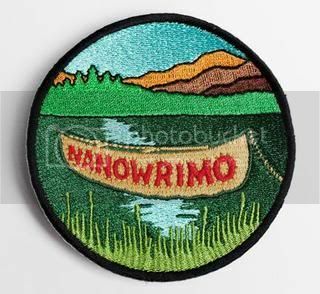 Camp NaNoWriMo is a version of National Novel Writing Month that takes place in any month instead of just in November like the original NaNo. It sounds like they will have it up and running for July and now that we are mostly settled in our new home (still a couple of boxes left to unpack), I'm eager to work on a novel that's been stewing in my head for several years. You can join Camp NaNoWriMo here and follow my progress here. Let me know if you're participating. I'd love to be camp buddies! Two geeks go on an adventure of a lifetime when one of them discovers that she's not just half alien, but heir to the galactic throne. The working title is Queen of the Universe but I'm thinking of making the second geek the main character though so the title may change. He's a guy who gets stuck tagging along with the queen as her sidekick, much to his annoyance. Not to go all Stephenie Meyer, but I first got the idea for this story from a dream. In it, I was in this big courtyard filled with all sorts of aliens who were being chased by a huge scary alien and for some reason they expected me to stop it! I woke up and, with that seed of an idea, plotted out a trilogy based around a high school girl who becomes queen of the universe and has to deal with all sorts of alien politics. I thought it was great, and promptly stuck the outline in a folder and left it alone - it just seemed too big for me. Five years later and I have two "practice" novels under my belt as well as a number of short stories. Before the move I started to think about writing Queen of the Universe again and even had two false starts, one writing it as a Young Adult with a female protagonist and the other as Chick Lit with an older main character. Neither of them clicked with me. Meanwhile, I wrote two short stories about the adventures of two geeks: Oggy, a slightly naive but level-headed guy, and Chu, the bubbly and somewhat maniacal girl who gets him into trouble. Suddenly I had a flash: what if these two were my main characters? I loved the thought of the kinda insane Chu being put in charge of the universe and Oggy having to deal with not getting to be the "special" one as well as having to clean up Chu's messes. Fingers crossed that nothing comes up to interfere with Camp NaNo! And because I like discussions, here are a couple of questions: Have you ever participated in National Novel Writing Month? Have you ever got the idea for a story from a dream?